Explore the east coast of Australia with the fun, wild and action-packed East Coast Fiesta! This tour includes 2 tours along the east coast as well as 4 additional nights accommodation! Explore Fraser Island, the Whitsundays, Airlie Beach and the town of Noosa with this 5 day, 8 night deal. The East Coast Fiesta Package is the perfect tour for backpackers and travellers looking for a fun and sociable tours with the chance to meet new friends. What do you get when you combine the top two destinations of the East Coast of Australia with the top two tours in the region? The East Coast Fiesta Package! To make things even better, we are including 2 nights accommodation in both Noosa and Airlie Beach without raising the price tag! Explore Fraser Island on a self-drive 4WD tour and get up close and personal with the Great Barrier Reef and Whitsunday Islands as you cruise, snorkel and dive the Whitsunday Islands on board the Atlantic Clipper. The East Coast Fiesta is the perfect package for the 18-30s and travellers looking to experience the east coast of Australia without missing out on any of the action. The package has been designed so that you may easily fit the two destinations into your travelling itinerary whether you are flying, driving or busing it up or down the East Coast and you can leave just days between the destinations or weeks if like. Get a thrill out of driving around the World Heritage listed island in a 4WD on the Nomads Fraser Island 3 Day self-drive Tour. For 3 days and 2 nights, you can spend your time exploring all of the natural beauty it has to offer. Cruise around 75 Mile Beach, which is actually the island's official road! Enjoy bushwalks, refreshing swims at Eli Creek, Lake McKenzie, Lake Wabby and Champagne Pools and see the stunning views from Indian Head. This tour includes 2 nights accommodation in a 16 bed dorm at our Nomads Noosa property and you'll get to enjoy a comfortable 2 night stay in a 4 bed dorm at Eurong Resort on Fraser Island. Exclusive post tour party at KB's Bar! Atlantic Clipper is the largest boat in the Whitsundays, spanning 140ft (34 meters), this mega yacht combines the awesome adventure and fun of sailing and diving with state-of-the-art diving equipment, modern facilities and air conditioning throughout. This mega yacht cruises at a quick 9 knots, giving you more time to enjoy each of the amazing Whitsunday locations that the Clipper takes you to. You will visit breath-taking fringing reefs, Whitehaven Beach and other unique destinations favoured by the crew. As a fully equipped dive boat, The Atlantic Clipper provides you with the opportunity to see the Great Barrier Reefs marine life up close and personal on scuba dives, no experience required but subject to medical conditions. In the evenings, there is never a dull moment with plenty of space for dancing, great music and crew entertainment. True Blue Sailing have recently partnered with Pioneer Jet to offer guests two new water sport activities to try out: jet boat and banana boat rides! Available on Day 3 of the tour, these optional activities do not need to be pre-booked, and are payable on board the vessel. Check in for the boat trip is in Airlie Beach the day before departure or early on the morning of the trip so best plan is to stay in town the night before and after the boat trip. Nomads Backpackers will give you the chance to see the thriving night life that Airlie Beach is renowned for across the country! Situated in the heart of Airlie Beach, opposite the swimming lagoon and beach, Nomads is no more than 50 metres away from all the facilities on offer making it the perfect place to stay to experience the Whitsundays. What fantastic value for money this boat is, you will not know what to do first, revel with the other passengers, check out the space and comfort, take to the water slide, on-board spa or just jump in water and start snorkelling! You can start in Airlie Beach or Fraser Island and use the nights accommodation in both places on whatever nights you like, but we would recommend using one night before and after each trip. Transportation between the two destinations is not included, the distance between Fraser Island and Airlie Beach is 960km (roughly a 12 hour drive), so you need to allow at least one day for travel. Please ensure you allow enough time for travel. Fraser Island - Pack a small backpack with your camera, a valid current drivers licence (for those who want to drive), your sunscreen, insect repellent, a hat, appropriate clothing, toiletries, a sleeping bag (also available for hire) and BYO alcohol and snacks. Whitsundays - Please only bring a small soft overnight bag without any zippers (ie. a re-usable shopping bag). A zipless souvenir bag can be purchased at the boat's check-in office for a few dollars. Ensure you pack clothes, a hat, swim-wear, beach towel, sunscreen 30+, warm pullover for the evenings (seasonal) and cash/card for on board purchases. Please feel free to bring on board a reusable water bottle and/or additional snacks. Excess luggage can be stored at several places in Airlie Beach, for example your boat check-in office or at your accommodation, and they usually charge between $5-10pp for whole trip. 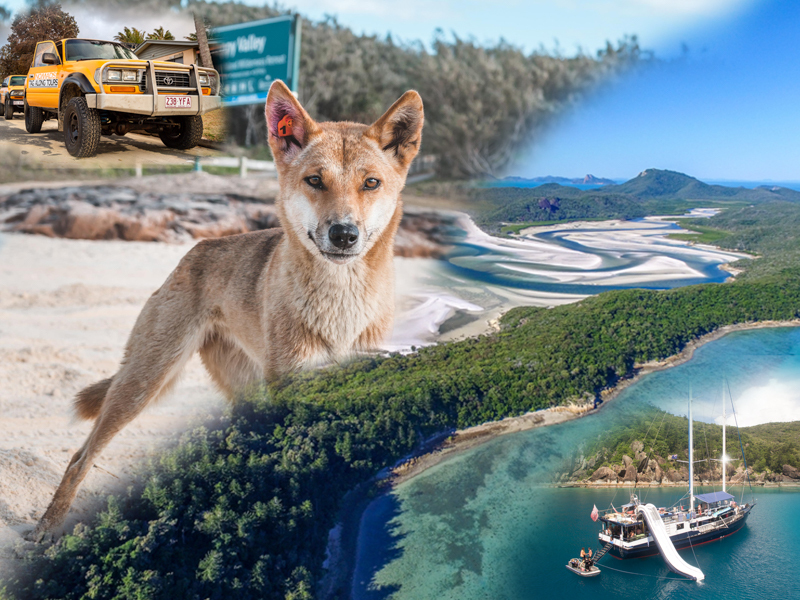 Fraser Island - Vehicle hire, vehicle and camping permits, meals while on the Island, return barge, fuel, 2xnt accommodation in a 16 bed en-suite dorm at Nomads Noosa, 2xnt accommodation in a 4 share en-suite dorm at Eurong Resort. Fraser Island - Sleeping bag hire if required is $10pp for the entire trip. $250 per person fully refundable cash bond to be collected in Rainbow Beach on the way to the Island. ( drivers - credit card imprint) The bond will be fully refunded provided the vehicle has been returned un-damanged. Please ensure you have $100 in cash as there is no ATM available at Rainbow Beach. Alternatively you can pay $10 non-refundable excess reduction fee instead. *Please Note: Diving is temporarily suspended on Atlantic Clipper. We are currently waiting to confirm return dates with the operators, thank you for your patience. Transfers - Getting between Airlie Beach and Rainbow Beach is not included, but we recommend the Greyhound bus service, they operate an overnight bus North and South bound daily, please enquire with us. Itinerary is subject to weather and tidal conditions and may be altered at operator's discretion at any time. Changes permitted up to 72 hours prior departure. Cancellations 72 hours and less prior departure and no-shows will incur 100 % cancellation fee. Itinerary subject to change due to tidal and weather conditions. All client cancellations forfeit 25% of total ticket price and all client cancellations made less than 21 days prior to departure will result in complete forfeiture of the full price of the package. If the tour operator has to cancel the trip and we cannot offer a suitable alternative, then a refund will be given minus card fees. We strongly recommend that you have travel insurance, especially during the wet season.